Holy cow. 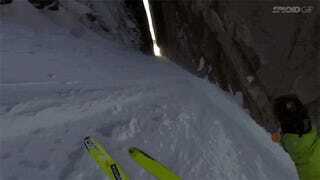 I don't know how professional skier Cody Townsend pulled off this insane ski line that saw him pretty much drop straight down and then through the most narrow of cracks while skiing insanely fast but he did it. The English language is not equipped to express how unbelievably mind-blowingly awesome his ski run was. The run won Powder Magazine's Line of the Year. I don't know how you top this.